I’ve been blogging for a few years and have been really enjoying it. In fact, I love it and couldn’t imagine doing anything else. However, there’s a few things that are annoying/stressful which is why I decided to write this post. Follow and then unfollow their blog. This is mostly do with blog hops. Someone will comment on your blog and say they are following you. Then you go and follow them back and then they unfollow you as soon as you follow them back. Ask them to sponsor your blog giveaway when they don’t have products for sale. Cheat on their giveaway. This has been a hot topic lately- check out these recent posts by The Shopping Mom and Eighty MPH Mom. Don’t say thank you when you reply with your address after winning their giveaway. Some people just send their address and that’s it. Maybe it’s me, but I always appreciate a simple thank you. Check out Eighty MPH Mom’s post Winning Graciously- Do You? Spam their Facebook page wall repeatedly. Flake on the giveaway prize. There’s a few companies out there who ignore blogger emails about their winner’s prizes not arriving and never send the prizes. Check out Budget Savvy Divas’ post “Must Read: Companies That Do NOT FULFILL Prizes For Giveaway Winners”. Ship the giveaway prize with the review item to the blogger and expect them to pay to send to the winner. Spam comments…need I say more? 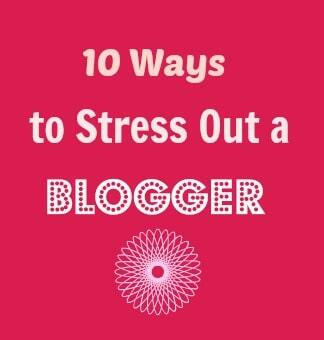 What annoys or stresses you out as a blogger? Thanks for posting this! I’m new to this world and this is good to know! Always good to practice common courtesy! All of these things really stress me out! Another thing that really bugs me is when I do a review with a company and they automatically ad me to their brand’s email list. I hate that! Oh and I thought of another one! When PR reps call out of the blue, to “follow-up” on an email they sent. I would much rather they just send it again, instead of calling. Drives me nuts!